HER2 has shown to possess predictive properties for the treatment with the monoclonal antibody trastuzumab (Herceptin, Roche/Genentech) in breast cancer, and the recent ToGA trial has shown similar characteristic in gastric cancer [1-3]. However, when it comes to the prognostic properties of the HER2 status there seems to be differences in how the marker is perceived in the two diseases. For breast cancer HER2 was found to be a negative prognostic factor very early on , but for gastric cancer there still seems to be no consensus, despite the fact that the first studies demonstrating an association between a positive HER2 status and poor prognosis appeared already 20 years ago [5, 6]. The gene for the HER2 protein (also known as ErbB-2, c-erbB2 or Her2/neu) is a proto-oncogene located on the chromosome 17. The HER2 gene encodes a 185-kDa transmembrane tyrosine kinase receptor protein, which is a member of the HER-family (HER1-4) [1, 7]. HER2 amplification and overexpression have been found to promote tumorigenesis and to be involved in pathogenesis of several human cancers [1, 3]. Slamon et al. demonstrated that amplification of the HER2 gene in patients with breast cancer negatively impacted the recurrence of the disease and the survival . For both gene amplification and overexpression of the protein similar results have subsequently been shown in a large number of studies. A recent meta-analysis, based on data from 39,730 patients, has further confirmed the prognostic properties of a positive HER2 status in women with breast cancer . For gastric or gastro-oesophageal junction cancer the prognostic significance of the HER2 status seems less clear and it has recently been discussed in relation to the publication of the results from the ToGA trial . In this study the patients with HER2 positive disease were randomized to receive chemotherapy (capecitabine (Xeloda, Roche) plus cispaltin or fluorouracil plus cisplatin) or chemotherapy plus trastuzumab. The primary analysis of the study showed a median overall survival (OS) of 13.8 month for the group of patients that received the combined treatment of chemotherapy and trastuzumab compared to 11.1 month for the group that was assigned to chemotherapy alone. In the discussion section of the paper recently published in the Lancet it was mentioned that the OS of 11.1 month in the group of patients receiving chemotherapy alone was longer than expected. As a possible explanation for this it was stated that HER2 overexpression might already be conferring a better prognosis across the groups of patients studied. However, it was also mentioned that HER2 overexpression leading to a better prognosis is in contrast to recent studies that have showed an association between HER2-positive tumors and poor outcome and aggressive disease. The authors further concluded that more studies are needed to address the issue of whether HER2 has an effect on prognosis in gastric cancer, and whether it confers a good or poor prognosis . For more than 20 years a relatively large number of studies on HER2 in gastric cancer have been published, and many of these have looked at the association between a HER2-postive status and survival and/or important clinicopathological characteristics. In this current systematic review we have utilized the already existing literature to address the issue on the prognostic properties of a HER2-postive status in gastric cancer. A PubMed search was undertaken to identify articles in English, from 1986 to August 2011, using the key word “gastric cancer” combined with “HER2”, “ErbB-2”, “c-erbB2”, and “Her2/neu”. Additional articles were found by a manual search for references from the already identified articles. The articles were included in the analysis, if they fulfilled the following two criteria. Criterion 1: The number of patients studied should be ≥ 100 and the HER2 status should have been determined by immunohistochemistry (IHC) or in situ hybridization (ISH) such as fluorescence in situ hybridization (FISH) or chromogenic in situ hybridization (CISH). Criterion 2: The selected articles should include an analysis of the association between the HER2 status and survival, e.g. OS and/or disease-free survival (DFS) and/or relevant clinicopathological characteristics such as serosal invasion, vascular invasion, lymph node involvement, distant metastases, disease stage, etc. Examples of the staining methods related to Criterion 1 are shown in Figure 1. The identified articles were scored according to the strength of the association between the positive HER2 status and the prognostic information reported, using a three point categorical scale. If a statistic significant association between the HER2-positive status and survival was reported, the studies were marked with two pluses (++) indicating the strongest association. For the studies where a statistic significant association between the HER2-postive status and relevant clinicopathological characteristics was found, the study was marked with one plus (+) indicating a somewhat weaker association. The studies were marked with a minus (-) where no association with a HER2-positive status was found. Separate tables were made for IHC or ISH and a weighted mean of the HER2-positive status was calculated together with the 95% confidence interval (CI) for each of the two assay type. For the studies conducted with IHC, 48 articles comprising 17,338 patients that fulfilled selection Criterion 1 were identified, and among these 38 articles comprising 11,860 patients also fulfilled Criterion 2. The weighted mean HER2-positive status for the articles that fulfilled both selection criteria was 17.9% (95% CI; 14.8 to 20.9). The corresponding range for the HER2-positive status was from 4.4% to 53.4%. Two out of the 38 articles comprised patients both with gastroesophageal junction and gastric cancer [8, 9], and for the patients in the remaining articles the cancer was localized to the stomach. The individual studies and the association between HER2 overexpression and survival and/or relevant clinicopathological characteristics are listed in Table 1 scored according to the 3 point categorical scale as described above. The article by H Grabsch et al. included two distinct populations, one from Germany and one from the UK, and these two populations have been treated separately and appear as two studies in Table 1. In 15 of the 39 studies (39%) an association was found between a positive HER2 status and poor survival (++), and a similar association with clinicopathological characteristics (+) was found in an additional 13 studies (33%). In the remaining 11 studies (28%) no association could be detected between a positive HER2 status and neither poor survival nor clinicopathological characteristics (−). In total for the IHC articles, 28 out of the 39 studies (72%) showed an association between a positive HER2 status and poor survival or clinicopathological characteristics. In the individual studies the analysis of the association between HER2 status and survival or clinicopathological characteristics were performed using both univariate and multivariate statistics. Twenty of the 39 studies used both univariate and multivariate statistics and for the remaining 19 studies only univariate statistics was used. For the studies where an association between HER2 status and survival was demonstrated (++), 11 of the 15 studies in this category used multivariate statistics. For the studies categorized as (+) or (++) the clinicopathological characteristics that was most often found to be associated with a positive HER2 status was lymph node status, serosal invasion or the depth of invasion, disease stage, and distant metastases. Further, for all the IHC studies (-/+/++) an association between overexpression of HER2 and the intestinal tumor type was found in more than half of these studies. When the studies where the positive HER2 status showed no prognostic value (−) were compared with the studies where the positive status correlated with poor survival or clinicopathological characteristics (++ /+) there was a trend towards a lower HER2 positivity rate for the “negative” studies. The weighted mean for the “negative” studies was 15.4% (95% CI; 9.4 to 19.2) compared to 18.2% (95% CI; 14.5 to 22.0) for the positive studies, however, as shown the difference was not statistically significant. For the studies that included ISH testing, 12 articles comprising 5,490 patients that fulfilled selection Criterion 1 were indentified, and among these 8 articles comprising 1,597 patients also fulfilled Criterion 2. The weighted mean for the HER2-positive status (amplification) for the articles that fulfilled both selection criteria was 12.2% (95% CI; 9.5 to 14.8). The corresponding range for the HER2-positive status was from 8.7% to 18.1%. Two out of the 8 articles comprised patients with both gastroesophageal junction and gastric cancer [9, 13], and for the patients in the remaining articles the cancer was localized to the stomach. The individual studies and the association between HER2 amplification and survival and/or relevant clinicopathological characteristics are listed in Table 2 scored according with the 3 point categorical scale. In 5 of the listed studies [9, 11, 12, 18, 24] the HER2 status was determined by both IHC and ISH, and these articles are thus listed in Table 1 as well as in Table 2. Examples of positive HER2 status in gastric adenocarcinoma of the stomach with overexpression of the HER2 protein (IHC3+) or amplification of the HER2 gene (HER2/CEN-17 ≥ 2.0). A. Immunohistochemistry (HercepTest™, Dako (20×)). B. Fluorescence in situ hybridization (HER2 FISH pharmDx™ Kit, Dako (40×)). C. Chromogenic in situ hybridization (HER2 CISH pharmDx™ Kit, Dako (40×)). The individual IHC studies fulfilling both Criteria 1 and 2. *This article comprises both a German and an English study population. -: No association found between HER2 overexpression and clinicopathological characteristics or poor survival. The individual ISH studies fulfilling both Criteria 1 and 2. -: No association found between HER2 amplification and clinicopathological characteristics or poor survival. In 3 of the 8 studies (37.5%) an association was found between a positive HER2 status and poor survival (++) and in further 2 studies (25%) a similar association was found with regards to clinicopathological characteristics (+). In the remaining 3 studies (37.5%) no association could be detected between a positive HER2 status and neither poor survival nor clinicopathological characteristics (−). In total for the ISH articles, 5 out of the 8 studies (62.5%) showed an association between a positive HER2 status and poor survival or clinicopathological characteristics. For the individual studies the analysis of the association between HER2 status and survival or clinicopathological characteristics were performed using univariate statistical methods only. For the studies categorized as (+) or (++) the clinicopathological characteristics that was most often found to be associated with a positive HER2 status was the same as mentioned for the IHC studies. Moreover, with respect to HER2 gene amplification an association with the intestinal tumor type was found in more than half of the studies. When the studies where the positive HER2 status showed no prognostic value (−) was compared with the studies where the positive status correlated with poor survival or clinicopathological characteristics (++ /+) the HER2 positivity rate seemed to be similar. The weighted mean for the “negative” studies was 13.3% (95% CI; 6.7 to 15.8), and the corresponding value for the “positive” studies was 12.6% (95% CI; 9.3 to 15.9). If the IHC studies in Table 1 are pooled with the ISH studies in Table 2 the total number increases to 42, comprising altogether 12,479 patients. The 5 studies [9, 11, 12, 18, 24], where the HER2 status was determined by both IHC and ISH are only counted once. In 17 of these 42 studies (~ 40%) an association between a positive HER2 status and poor survival (++) was found, and an additional 13 studies (~ 31%) similarly showed a relationship with clinicopathological characteristics (+). In the last 12 studies (~29%) no association between a positive HER2 status and poor survival or clinicopathological characteristics could be detected (−). Overall, this means that in 30 studies (71%) an association between a positive HER2 status and poor survival and/or relevant clinicopathological characteristics could be found. Figure 2 illustrates the number of IHC and ISH studies and patients in each of the three scoring categories. The number of IHC and ISH studies and patients (N) in each of the three scoring categories. Symbols: Two pluses (++) indicate the strongest association with the HER2+ status, one plus (+) indicates a somewhat weaker association with the HER2+ status, and minus (-) indicates that no associations with the HER2+ was found. This systematic review has been based on 42 publications covering the period from 1991 to August 2011 and comprises a total of 12,749 patients with gastric cancer. The majority of the articles (71%) reviewed showed that a HER2-postive status measured either by IHC or ISH provides additional prognostic information either related to survival (40%) or to relevant clinicopathological characteristics (31%), which included already established prognostic factors such as serosal invasion and lymph node metastases . A clear trend towards a potential role for HER2 as a negative prognostic factor in gastric cancer was shown, although the data is not as consistent compared to what has been reported for breast cancer . An issue that weakens the conclusion in this systematic review is the fact that multivariate statistics was only used in approximately half of the reported studies. However, it has recently been suggested that HER2 overexpression and/or amplification may be one of the molecular abnormalities linked to the development of gastric cancer, especially in the intestinal phenotype , and this support the data presented in this review. For the studies in the current review that have looked at the Lauren classification in relation to HER2, a higher level of overexpression or amplification was found in the intestinal phenotype compared to the diffuse or mixed types [8-12, 16-21, 23, 25, 27, 28, 41, 44, 46-48]. A few of the IHC studies also seems to show that the expression of HER2 increased with disease progression [5, 33, 34, 38]. Based on the results of the current review it seems unlikely that HER2 overexpression or HER2 gene amplification could act as a positive prognostic factor in gastric cancer, as has been hypothesized in the publication of the ToGA trial in the Lancet . None of the articles that fulfilled Criteria 1 and 2 in this analysis support this hypothesis. Possible confounding factors, such as a wider use of second line treatments and a possible better prognosis related to the intestinal phenotype, should be taken into consideration when interpreting the data from the ToGA trial . With regards to the latter it is worth mentioning that approximately 75% of the patients included in the ToGA trial had tumors of the intestinal type , which seems to be high compared to most of the studies reported in this review. In support of the hypothesis put forward in the Lancet article one study has been identified, which, in fact, showed that overexpression of the HER2 resulted in a better prognosis compared to those who did not overexpress the protein. However, this study was not included in this review due to the number of patients being <100 (Criterion 1). Here, samples from 93 patients with advanced gastric carcinoma were investigated using IHC. Overexpression of HER2 was found in 10 patients (11%) and a multifactorial analysis showed a significantly better prognosis for those patients in relation to survival . A relatively large variation was found in the HER2 positivity rate between the individual studies included in this review as appears from Table 1 and Table 2. Here, the largest variation was seen in the IHC studies, where the range in relation to the percentage of patients with HER2 positive tumors was found to be between 4.4% and 53.4%. The explanation for this rather large variation is likely to be multifactorial such as the difference in the populations studied, but the most important aspects are probably the use of non-standardized assays using different antibodies and the application of different scoring criteria for the stained slides. In the majority of the studies conducted within the last couple of years the scoring criteria developed by Hofmann et al. for the ToGA trial  or related were used, which seems to have resulted in less variation (range: 9.4% - 15.7) [8, 9, 12, 24, 25]. Also for the ISH studies some variation in relation to the percentage of patients with amplification of the HER2 gene (range: 8.7%-18.1 0%) was found, although the magnitude is much smaller. This is likely explained by the fact that the FISH and CISH assays are quantitative methods compared to IHC, which use a semi-quantitative scoring system. Despite the fact that the number of studies conducted with IHC is much higher than for ISH there seems to be no major differences in the results obtained. For the IHC articles, 72 % of the studies (28 out of the 39) showed an association between HER2+ status and poor survival and/or clinicopathological characteristics (++/ +). 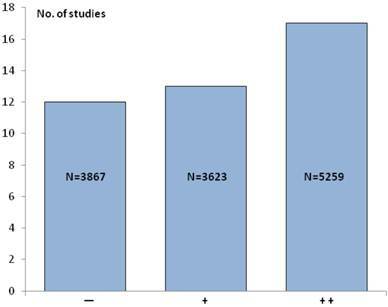 The similar figures for the ISH studies were 63% (5 out of the 8). The trend towards a lower HER2 positivity rate for the “negative” studies that was observed for IHC may be explained by the large variation seen with this type of assay compared to ISH as described above. The analysis of 42 publications comprising a total of 12,749 patients with gastric cancer showed that a positive HER2 status, measured either by IHC or ISH, adds information to the prognosis of the disease. Based on the current analysis a clear trend towards a potential role for HER2 as a negative prognostic factor in gastric cancer was shown, which suggests that HER2 overexpression and/or amplification might be a molecular abnormality linked to the development of gastric cancer. We would like to thank Dako Denmark A/S for their permission to use the microscopic gastric adenocarcinoma images. Jan Trøst Jørgensen has worked as a consultant for Dako Denmark A/S, Glostrup, Denmark and has given lectures at meetings sponsored by Roche and AstraZeneca. Maria Hersom has nothing to disclose. Corresponding author: Dx-Rx Institute, Baunevaenget 76, DK-3480 Fredensborg, Denmark, Phone: +45 4074 7846, Fax: +45 8870 8090, E-mail: jan.trostdk.